When I was married, we had talked about how we would fit five girls in one room. I felt confident that I could squeeze two sets of bunk beds in the smaller bedroom, but it would be crowded. 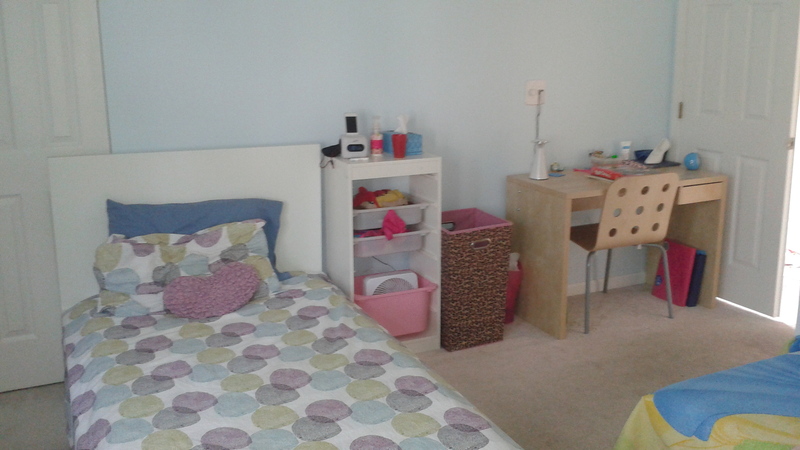 We talked about one day possibly switching rooms, giving the girls the Master Bedroom while we took a smaller bedroom. There was no hurry, though. We were still using a queen and a twin smashed together to hold us and our two youngest (and #3 when she would crash through the door in the middle of the night). Plus, we knew that the Master Bathroom would need massive work before the girls could use it. 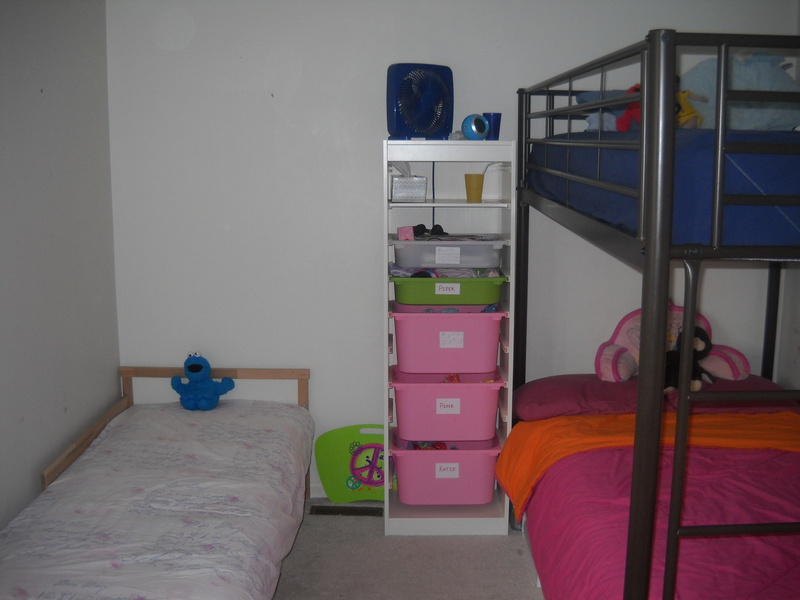 This was what the girls’ room looked like when I reorganized and added the bunk beds in Spring 2012. Once I decided to start fixing up the house, I also decided that we would go ahead and switch rooms. 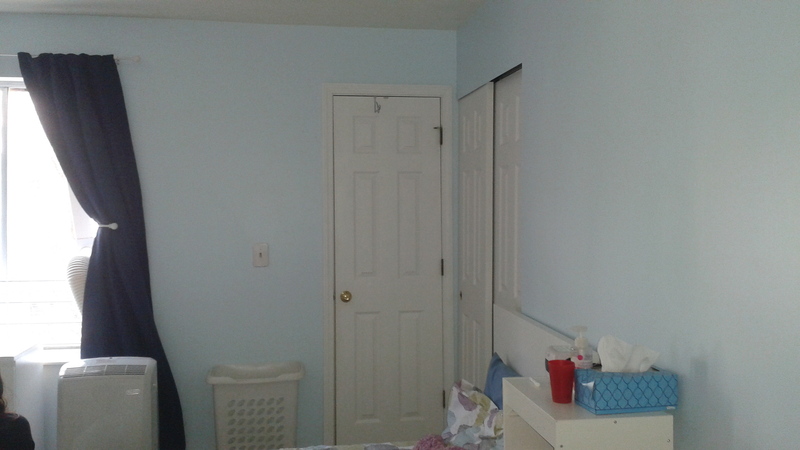 The girls and I haggled before agreeing on Arctic Blue (Glidden) for the walls. I chose Swan White (Glidden) for the trim. After painting the walls, it was really a waiting game until my handy man could come and dismantle the bunk beds and reassemble them in the Master Bedroom. Once that finally happened, I was able to do the rest of the heavy lifting and furniture assembly to get the room put together. This is the view from the bedroom door. You can see the top of Bailey’s bed. The doors on the right are for a smaller closet being used for storage: boxes of hand-me-downs, large musical instruments (guitar and keyboard), and the travel bags they need for visitation with their dad. The other door is for the walk-in closet. We’re going to pretend that the walk-in closet is neatly organized with clothing and toys all in their proper places. Here we have the foot of Bailey’s bed and the new dresser from IKEA (Malm series) for Bailey’s and Piper’s clothes. 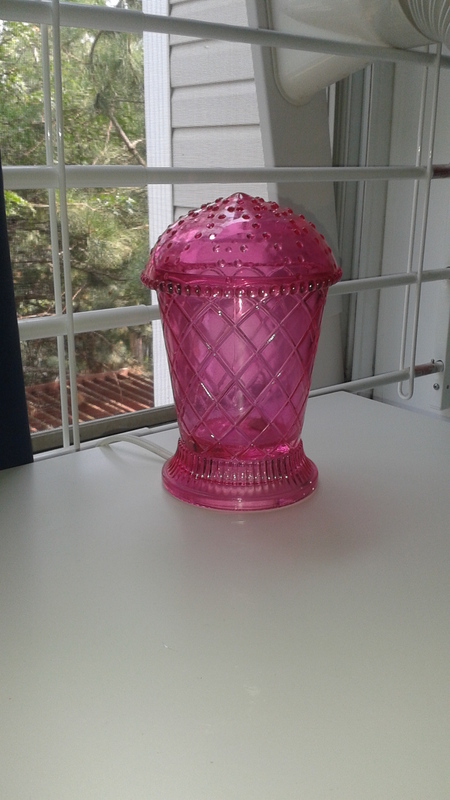 The little pink object on the dresser is a cute little lamp I also picked up at IKEA that serves as our new nightlight for the room. 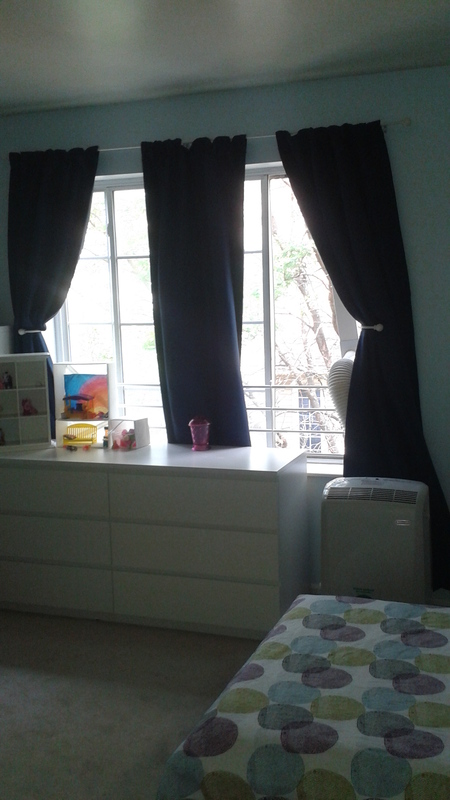 The black-out curtains are the same as were in the room before, but they have been washed and a new curtain rod and metal curtain pull-backs were installed. The girls also upgraded into the only upstairs place where we could set up the portable air conditioning unit. The top bunk is Piper’s domain. The bottom bunk will be used by Sabrina (hopefully within the next year). The “little bed” is a size in between a toddler bed and a twin. We purchased it from (guess where?) IKEA two years ago for Katie, and she decided she’d rather keep her little bed than move into the bottom bunk. Katie’s clothes are in the drawers under her bed. Sabrina’s clothes are in the drawers under her bunk. And here we are full circle. 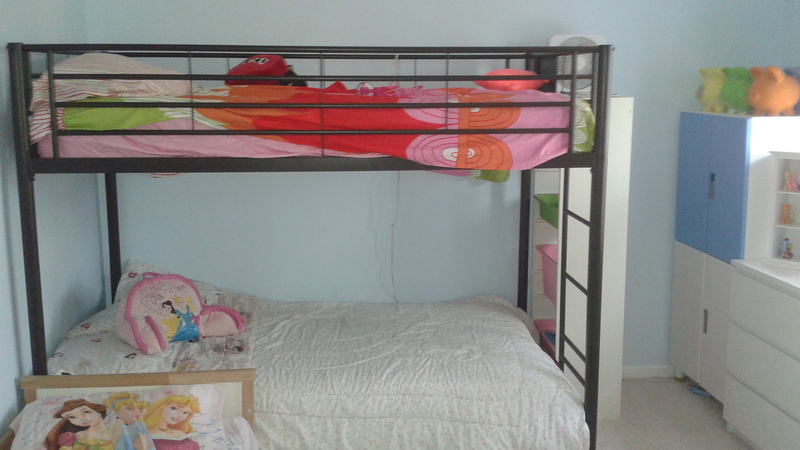 This is Bailey’s new bed (Malm series from IKEA) with an old, shorter Trofast frame. We tried moving the desk and chair (both from IKEA) down to the basement, but Bailey found all of the noise from the main floor too distracting. Then we have the laundry basket and a small trash can tucked in there, too. 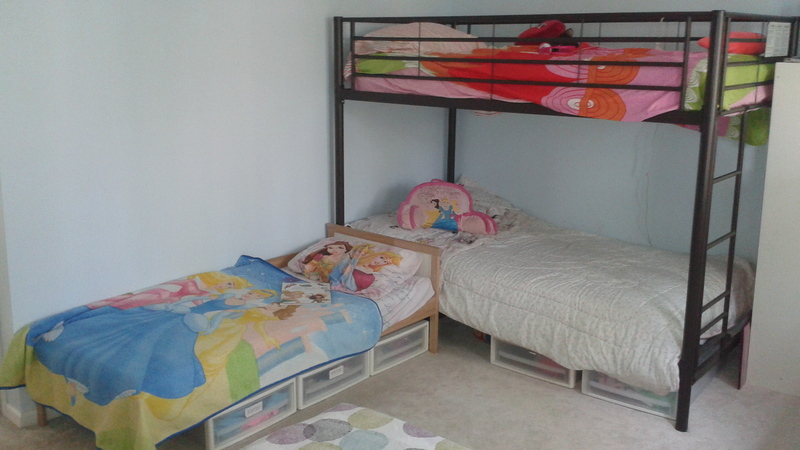 We still have wall decorations to put up and things to organize, but the girls seem to really like their new room. I have a few ideas of what to do when Cassidy gets old enough to need her own sleeping space. I could try to move Piper and Bailey down to the basement. Or I could squeeze another “little bed” in where the desk is maybe. We’ll just have to cross that bridge when we come to it. 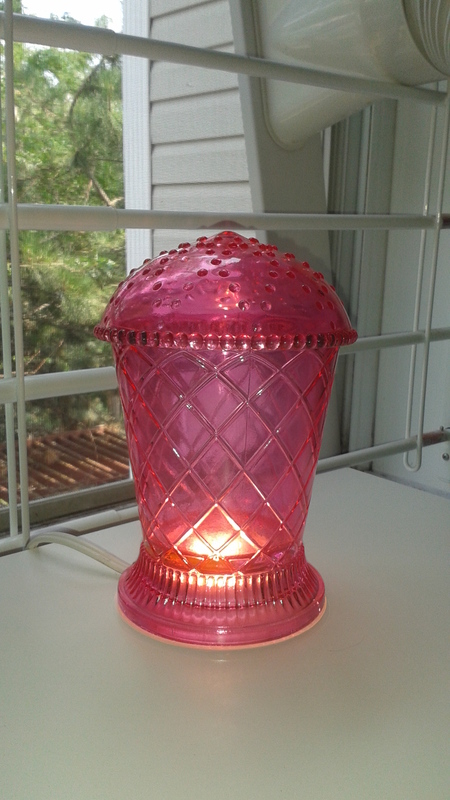 And since I couldn’t find a link to the cute little lamp, I just had to add some pictures on my own. It’s real glass, with an LED light underneath it. At night, it sparkles against the ceiling. Four of us moved in to our three-bedroom, three-story town home in June of 2006. Then we had three more kids in the span of six years. Then in October of 2011 my mother-in-law moved in with us. In March of 2014 I filed for divorce from my husband of 14 years, and he moved out. I was kind of uncertain as to what would happen with our house. It is underwater, being worth way less than what is owed on the mortgage. As part of the divorce agreement, though, it was arranged that my ex-husband would keep his name on the mortgage for five years, but then I have to sell or refinance into my own name. So, for now the kids get the consistency of staying in their own home while dealing with the changes that divorce brings. It was about a week after the separation that I began to realize that with the kids leaving the house every other weekend to go to their dad’s that I might actually be able to fix the house up. The idea of painting was something that had just seemed too over-whelming while dealing with 5 young children, a horrible marriage, and crippling depression. But with the activation of my Zoloft and dropping the burden of trying to stay in the marriage, things suddenly seemed possible. My first plan of action was to fix up the Master Bathroom. It had basically been my ex-husband’s private bathroom. 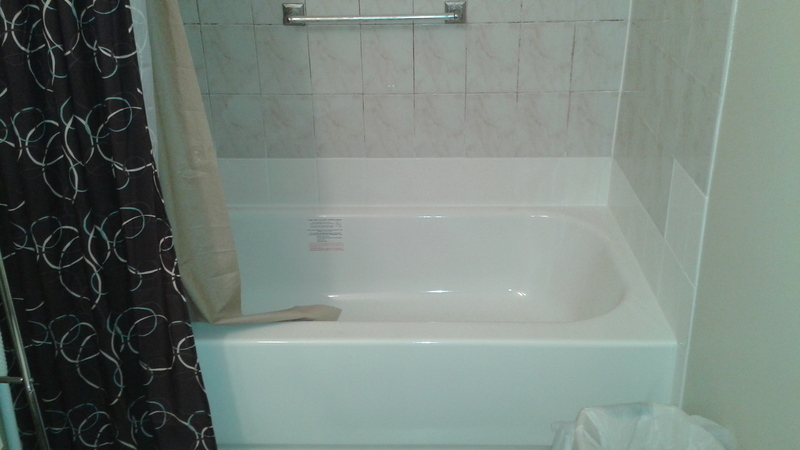 It had an old soaker spa jet tub, whose jets had broken a year or two after we moved in. I had rarely used them anyway, because mildew and soap scum would always build up in the jets, making bathwater gross enough even before you added the air bubbles. The toilet had been leaking for a few years, and I had been seeing the effect in our water bills for about a year. Mildew had basically taken over the whole room, and in the course of eight years almost every fixture (including the gigantic, mirrored medicine cabinet) had fallen off the walls. Whether we were able to stay in the house or had to sell it, the Master Bathroom had to be partially remodeled. First I had the toilet replaced. Then we had to remove the old tub, put in a new tub, and do a tile patch. Unfortunately, I couldn’t afford to re-tile the entire bathtub area or replace the tile with a new liner. My handy man also discovered mildew under the floor tiles when he was putting in the tub, so I had to get new peel-and-stick vinyl floor tiles. There was also water damage to one of the walls where the shower curtain had not been closed properly. Once all of that was done, I scrubbed and painted the walls (Glidden Water Chestnut) and the trim (Glidden Cinnamon Spice). 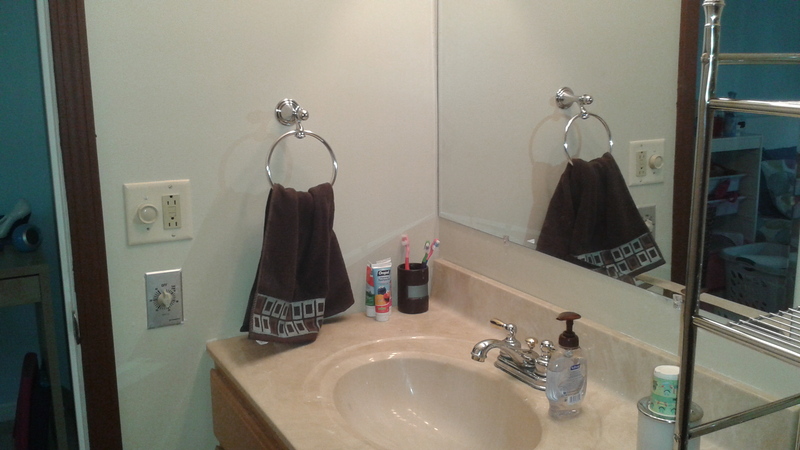 Then my handy-man returned to finish adding new trim and put up a new mirror, hand-towel ring, and towel hooks. So, here is the finished product. 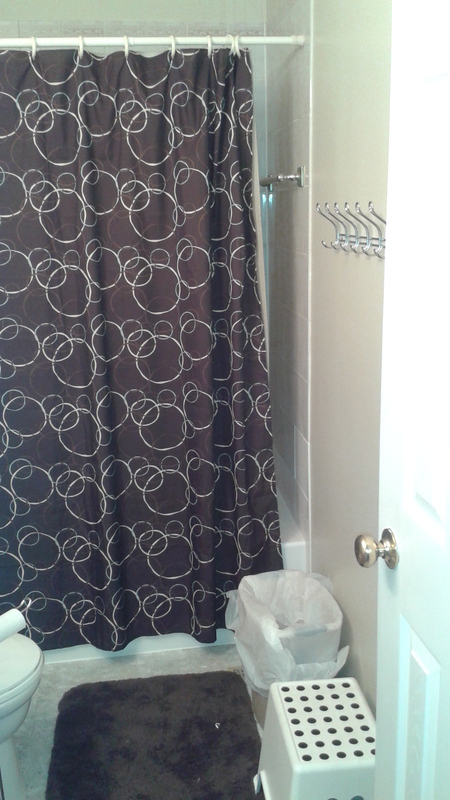 New shower curtain and towel rack. New bath tub and tile patch. 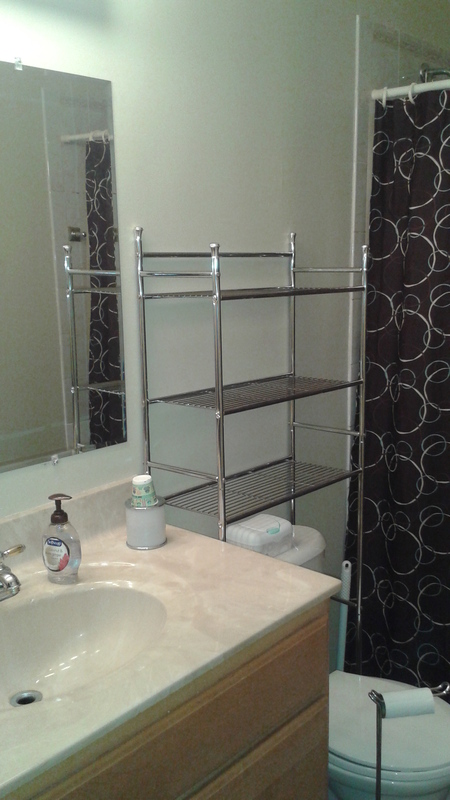 New toilet, rack, mirror, and sink accessories. New hand towel ring and sink accessories.